GTM Research tracks new regulatory tools and policy overhauls to support a grid-edge ecosystem. We’re going to need some sophisticated software to integrate distributed rooftop PV, behind-the-meter batteries, plug-in EVs and smart-metered, energy-savvy homes, office buildings and factories into the grid. We’ll also need some sophisticated policy-making. GTM Research will soon release a comprehensive report on the global market for distributed energy resource management system, or DERMS -- the software that’s connecting grid-edge generators and loads to grid sensor and control networks in projects around the world. Along with a detailed analysis of existing projects and a vendor-by-vendor breakdown, the report highlights which states are pushing the regulatory boundaries on the grid edge. The first map represents the current state of play, in terms of broader regulatory frameworks that help utilities support customer-owned generation. In many states (the white ones on the map), utilities still make money directly through kilowatt-hour sales, while the dark blue states like California have taken the biggest steps toward decoupling energy sales from revenues. Light blue states have implemented different lost revenue recovery mechanisms, while the tan-colored states are working on regulations as we speak. 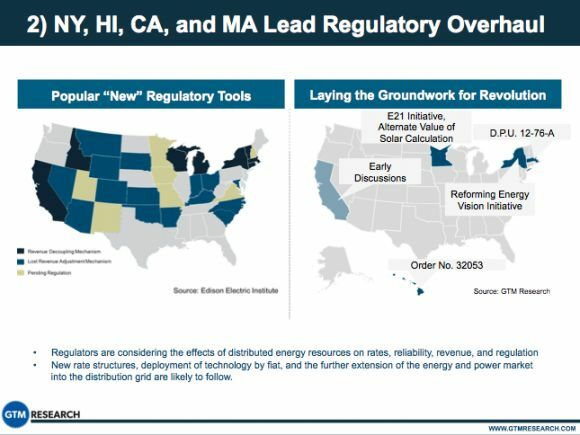 The second map shows five states that are “laying the groundwork for revolution,” through broader restructuring of energy markets to integrate distributed and customer-owned assets into the grid. We’ve been covering these changes on a state-by-state basis. Here’s a recap of the latest action. 1) New York. The Empire State has taken what’s arguably the biggest step toward a DERMS-friendly grid with its Reforming the Energy Vision (REV) initiative. Launched by Gov. Andrew Cuomo in April, the plan calls for the state’s utilities to become “distribution system platform providers” (DSPPs), able to track, trade and forecast distributed energy assets, from the customer premise up to the regional energy trading system. New York utilities have already proposed billions of dollars of infrastructure investments that would rely on distributed resources, whether to make up for the closure of the Indian Point nuclear power plant, or to create microgrids to provide power during the next Superstorm Sandy. 2) California. California hasn’t turned the transition from a centralized to a two-way, distributed energy future into an overarching mission statement in the same way as New York has. But as the leader in solar PV, plug-in EVs, grid-scale energy storage and home automation technologies, the Golden State has been engaging in a broad overhaul of grid regulations, piece by piece. Last month, the California Public Utilities Commission officially opened the latest chapter in this effort, a multi-year plan to transform the way utilities do distribution grid planning (PDF). The idea is to renovate the decades-old methods of estimating future growth on the “last-mile” electricity delivery system, to take all the solar PV, energy storage and demand response that’s coming on-line into account. On the system-wide scale, the California ISO is working on methods to incorporate distributed resources into long-range grid planning and economics, as well as seeking “flexible resources” that can help it manage the solar-created daily demand imbalances (the so-called “duck curve”). 3) Hawaii. If California is the vanguard in the grid edge revolution, Hawaii is the canary in the coal mine. Rooftop PV has exploded on the islands in the past five years, undercutting utility power from oil-fired generators and putting some distribution circuits into backfeed conditions on sunny days. Oahu utility Hawaiian Electric put increased restrictions on new solar interconnections last year, and the state’s Public Utilities Commission has demanded that utilities come up with a way to integrate distributed PV into its plans. Hawaii also provides some grand-scale manifestations of the economic incentives that are making islands an early target for microgrid and virtual power plant systems. The state is planning for up to 200 megawatts of grid-scale and distributed energy storage, and it is the home of real-time demand response and energy disaggregation pilot projects to bring customers’ energy usage into play for grid stability. 4) Massachusetts. While Massachusetts hasn’t gone as far as New York and California, it has started asking its utilities to take the distributed energy landscape into account in their smart grid investments. In June, the state Department of Public Utilities released two new orders that require smart metering and time-of-use pricing to play a role in future distribution grid planning. It has also launched a microgrid program, and is reworking its solar policies as well. 5) Minnesota. This state’s main contribution to the DERMS-friendly regulatory landscape comes through its March decision to create a value-of-solar tariff (VOST), a mechanism for taking multiple grid impacts of distributed PV into account when pricing its value to utilities and customers. VOSTs have been tried out at the city scale, but Minnesota is the first to take it statewide. 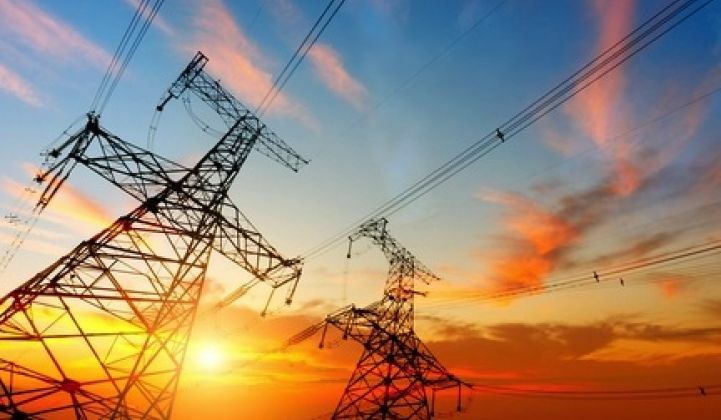 Meanwhile, a public-private working group called the e21 Initiative has been formed to work out changes needed to bring the state into alignment with the changing grid landscape.